World-traveling nomads Valerie Cook and Tim Boffe have refurbished an old school bus to double as the family’s eco-friendly home on wheels and a modest hostel for adventurers. The revamped 39-foot-long solar-powered bus is currently carrying the family of three on a three-year European adventure and picking up guests along the way. The adventure-loving family estimates that converting the bus into a traveling home cost just under $32,000 dollars. The renovation process focused on revamping the old bus with environmentally-friendly features, such as a chemical-free Doschawol wool insulation, which not only helps keep the bus warm and cozy, but regulates moisture that tends to build up when traveling between cold and hot weather destinations. The family’s electricity needs are met by solar panels installed on the bus roof, while other basic needs are met by an onboard shower, compost toilet, and wood stove. The family tries as best they can to make their travels 100 percent carbon-neutral, offsetting the rest through the non-profit organization Carbon Fund. 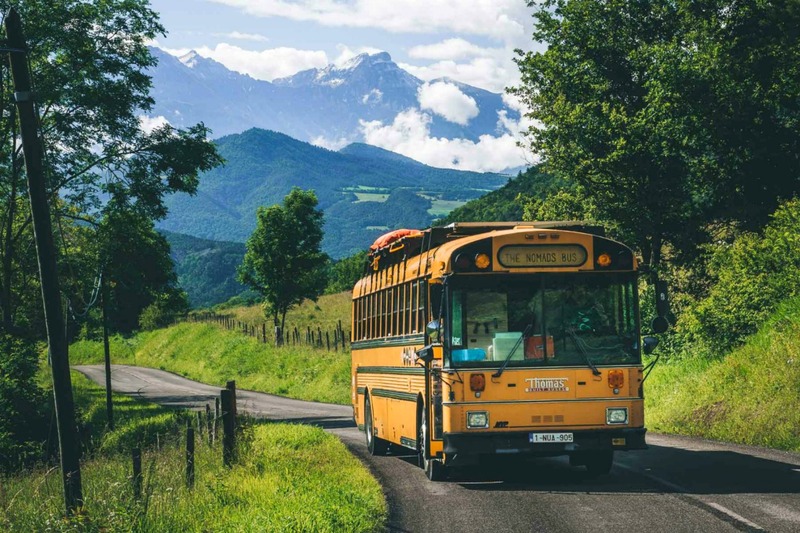 Currently, the six-bunk bus is touring Tirol, Austria and is available for adventure seekers at a mere USD $61 per night. This includes all of the basic amenities such as sheets and towels as well home-cooked organic breakfasts and dinners. Extra perks include the use of the couple’s mountain bikes, skis and surfboards. Any idea what engine they installed or hat solar panels they used? World-traveling nomads, Valerie Cook and Tim Boffe, have refurbished an old school bus to not only be the family's eco-friendly home on wheels, but also as a modest hostel for adventurers. 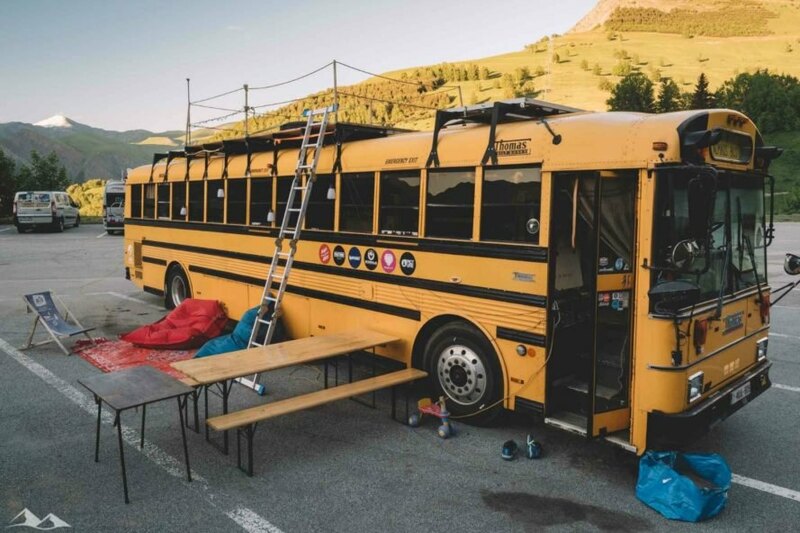 The revamped 39-foot-long, solar-powered bus is currently carrying the family of three on a three-year European adventure and picking up guests along the way. 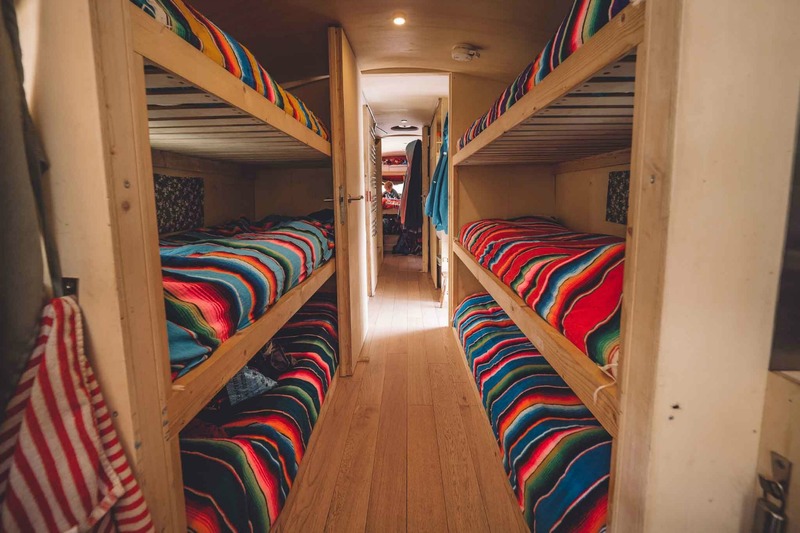 The adventure-loving family estimates that converting the bus into a traveling home cost about just under $32,000 dollars. The renovation process focused on revamping the old bus with environmentally-friendly features, such as a chemical-free Doschawol wool insulation, which not only helps keep the bus warm and cozy, but regulates moisture that tends to build up when traveling between cold and hot weather destinations. The family's electricity needs are met by solar panels installed on the bus roof and basic needs are met by an onboard shower, compost toilet, and wood stove. A list of environmentally- concious sponsors on posted on the side of the bus. Solar panels help generate electricity for the family and their guests. As far as the family's carbon footprint as they travel, the couple tries as best they can to make their travels 100 percent carbon-neutral, but what they can't reduce is offset through the non-profit organization, Carbon Fund. The dorm room has six bunk beds for guests. The Nomads Bus kitchen is small, but has all of the comforts of home. A wood burning stove helps heat the bus in cold weather destinations. The bus's living room has a flexible layout and plenty of storage. A stay on the bus includes all of the basic amenities such as sheets and towels as well home-cooked organic breakfasts and dinners.